Technically this isn't eating out, it is taking away, but close enough! Charlie's Fruit Market is a 24-hour fruit and vegetable shop open at Everton Park. A while ago they opened up a very vegan friendly mostly raw take away in the shop called Charlie's Raw Squeeze (not open 24 hours), they also have a cafe location at Stone's Corner. 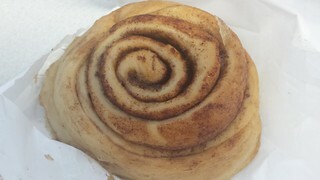 I decided to head out there for lunch one day during a quite day at work a few weeks ago, and also because I had just been informed that they stocked vegan cinnamon buns (more on that later). I was pretty impressed when I got there. They have a large menu of smoothies, nice cream and acai bowls as well as a cabinet full of bowls, salads and wraps and a large variety of vegan desserts. Most of the desserts were raw (yuck, coconut oil), but they also stock Cloverly Cupcakes and those cinnamon buns (more on that later). 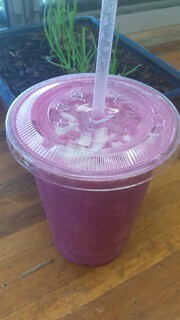 I couldn't go past the Cotton Candy Smoothie ($8 for small), which had red dragonfruit, banana, coconut water and coconut chips in it. I was delighted when I was given it, it is so pretty and pink! Thankfully it doesn't actually taste anything like cotton candy, but it is a not-too-sweet refreshing treat. 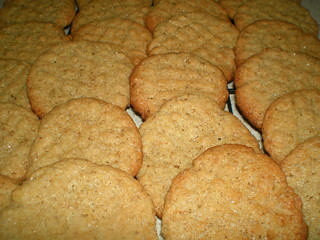 The coconut chips blended up into it and sprinkled on top make it quite filling as well. I couldn't go past getting their Taco Bowl ($15.95), which I had heard many good things about. And it was so good. 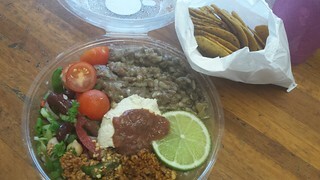 It had raw walnut meat, a salad of greens and beans (I picked out all the capsicum and raw onion from this before eating), fresh tomatoes, lentils and rice, a hefty serving of guac and a dollop of cashew cheese and salsa (not too spicy), served with a baggie of corn chips. This was so filling, and so delicious! Now... about those cinnamon buns. Cinnayumm recently started selling delicious vegan cinnamon buns at the Boundary Street markets, but also supply Charlie's. They have cinnamon buns with all sorts of crazy toppings, but they also have them plain, which is my favourite ($5). This was divine! Eating it made everything happy for a little while. 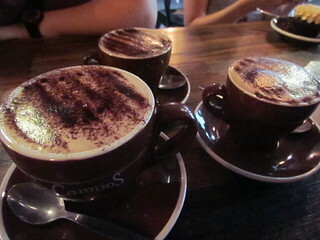 I am definitely planning on heading back to Charlie's, both for more cinnamon buns and to explore their menu further. They also stock a small range of vegan goodies (including ice creams and Gardein), and the fruit and vegetable shop itself is fairly extensive. This is takeaway only, there is no where to sit. But lots of parking for you to stop by and pick up a yummy! 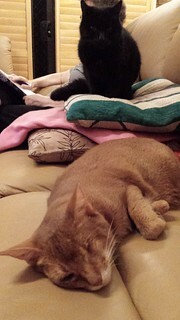 Bingo and Blaize, two former adoption cuties. Blaize has a very serious heart condition, but I am happy to say she is doing great in her new home! 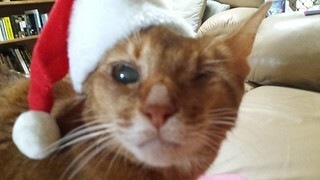 I observe Christmas in a strictly secular sense, which means making a yummy lunch to share with my family, lots of kitty hugs and some nice presents. 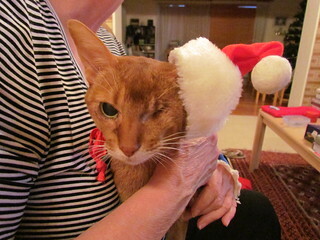 Christmas tends to be a bit sad as well, as we are missing Gizmo, Possum and Spock from our family. 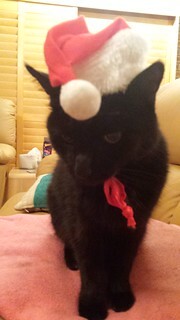 The last week I had Gizmo home was over Christmas in 2011, so Christmas without her now is always harder. I started my Christmas morning with a 7.30am bikram yoga class. I have been practicing bikram for just over two years, and it is a pretty great way to start off a day that is going to involve a lot of food! The Christmas morning class is the busiest class of the year at the studio, which does mean overcoming some panic about being packed in with that many people, but I was able to get through it and enjoy a lovely class. 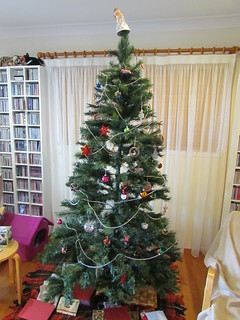 When I got home, we opened presents and then I snacked on some fruit while getting lunch ready. I got some lovely gifts, including the first three volumes of the Buffy Season 10 graphic novels, a new cookbook, a couple of DVDs and a 6 months subscription to a new Australian-based vegan mystery box (I will report when the first one arrives!). Anyway, let us move on to lunchier topics. This was actually a fairly simple lunch to put together. There some time involved, but nothing complicated. Festive Kale Salad with Sweet Apple-Cinnamon Vinaigrette from Oh She Glows: I massaged the kale the night before and left it overnight in the fridge to get really nice and soft. I actually had chopped the kale and made the dressing on the Wednesday so I could massage it together when I got home after work on Thursday. 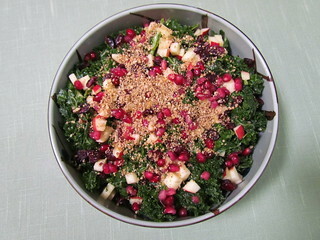 This is a really nice salad, with a great dressing and the apple, cranberry and pomegranate seeds (I seeded my first pomegranate for this) gave lots of nice sweet bursts. The pecan parmesan was also really nice, and added a salty contrast. I added a bit more nooch to the parmesan that the recipe required because nooch is life. This made a hefty amount of salad as well! Pan-Fried Paprika-Spiced Sprouts from Keep It Vegan: This came together very quickly and easily. 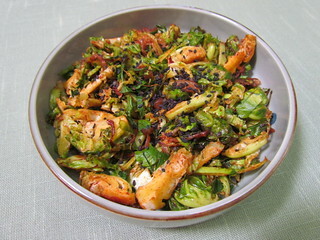 The recipe calls for finely sliced Brussels sprouts, I sliced my sprouts in half and then sliced them into four or five strips depending on the size of the sprout. I wouldn't call it finely, necessarily, but it was fine! I used black sesame seeds on top instead of toasted sesame seeds because I have some to use up. 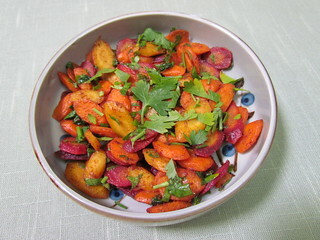 Cumin-Spiced Carrots from Keep It Vegan: I was able to get a small pack of rainbow carrots to make this very pretty. The carrots are boiled first, and I took Aine's advice to boil the purple ones separately! They are then sauteed with some butter, herbs and spices. 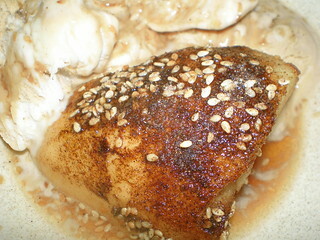 There is the option to use some agave or pomegranate molasses for some sweetness, and I used the pomegranate. I found that I needed to add quite a bit of salt to this. The recipe recommends drizzling with olive oil before serving, which I forgot, but I would recommend as they were a smidge dry. 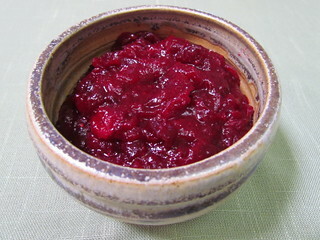 Cinnamon Citrus Cranberry Sauce from Keep It Vegan: This is definitely my new go to cranberry sauce! You need to make this at least the day ahead, I made it two days ahead. Cranberries are cooked down with orange, cinnamon and some other spices, and then as it chills it mellows into this amazing sauce, with lovely flavours. Definitely a cut above the straight forward cranberry sauce! 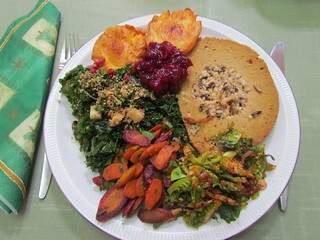 For the centerpiece I ordered a Vegan Meals Delivered roast from the Cruelty Free Shop. The roast came frozen, but said to thaw overnight and then bake for no longer than 30 minutes at 200dC to avoid drying out. I did this and when I sliced into it it was still cold! They say you can eat it cold straight away, but I was aiming for something a bit hot for the table. I ended up throwing it in the microwave for a couple of minutes to heat it through, because everything else was ready. The roast was OK, a little dry, nice flavour, but extremely heavy in your stomach after eating. It was fun to try a new roast, but I think next year I will be trying something else. Around the roast is our favourite potato dish for Chrismtas, the Potato Squashers from Eat, Drink & Be Vegan. I have made these many times, and their rating is a thousand million super happy smiley faces. 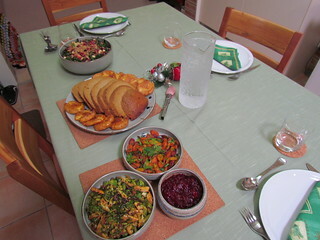 Some photos of food on the table, and of course the photo of my full plate. Of course, what is Christmas without Christmas pudding? 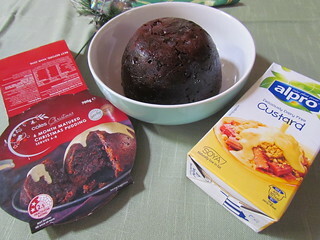 One of the Coles puddings has been vegan for the last two years, which is great! Served with some soy custard. After lunch we lazed around, watched some TV and played a fun game of Sushi Go, a new card game I bought for family fun times. In the evening we just nibbled at some leftovers. And then I made a mini dessert plate for myself. The cookies are Pfeffernüsse, one of my favourite Christmas traditions as a kid. I haven't been able to find any to eat since I went vegetarian (because the ones they sell here contain gelatin in them), let alone vegan. But earlier this year my friend Leigh brought my two bags of vegan ones home from Berlin. The first bag was consumed immediately, the second was frozen for Christmas. They are so nice! The glass is some nog made from powdered nog, which was not great and I highly recommend avoiding it at all costs (I think the brand is Alpine something? I threw it straight in the bin). And some fruit! 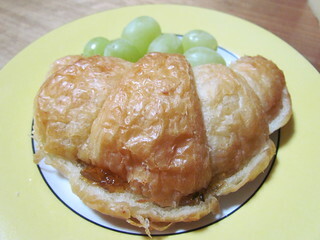 One tradition we used to have when I was little was croissants for Christmas breakfast. For years vegan croissants were not to be found and I made pancakes for myself, but now I have replaced breakfast that with my new tradition of yoga and fruit. However croissants are now available in Brisbane, and I like to work them in somewhere. So, on Boxing Day, I enjoyed two croissants - one with a lovely tart feijoa jam a friend brought my from New Zealand, and another with some Tofurky ham and Tofutti cheese. 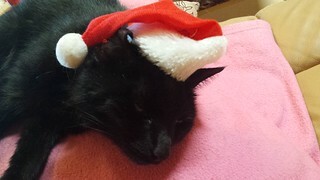 I don't ever try and dress my cats up, except on Christmas when we play a fun game of trying to get the kitty Santa hat to stay on their heads and for them to stay still enough for my to take a photo! Enjoy! Let Them Eat Vegan by Dreena Burton is my second favourite of her four cookbooks that I have (I don't have Plant Powered Families... yet). It is full of healthy and fun recipes, including a hefty cookie and ice cream section. It is the home of the Berry Patch Brownie recipe that will revolutionise your bake sales! But has lots of other great recipes as well. I have blogged about other recipes I've made from this book before. 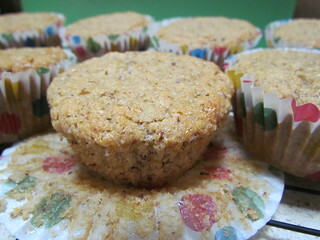 Citrus-Scented Almond Muffins: These muffins are based on barley flour and almond meal, which gives them a nice texture, though I could have done with them being a little stronger with the citrus flavour, which comes from orange and lemon zest. Lemon-Infused Mediterranean Lentils with Roasted Fennel with Orange and Thyme: This was a lovely dinner with some good flavours. 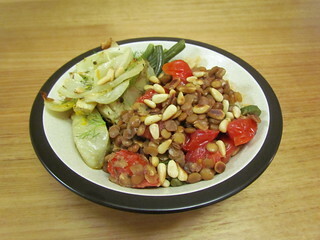 The lentils have a nice lemon and herb kick, and are studded with pine nuts, capers, tomatoes and olives. Dreena loves roasted fennel, and the side dish was one of two flavour options. It was sensational! I also served this with some green beans and brown rice. Potato, Shallot, and 'Pepper' Frittata with Simplicity Asparagus: So obviously I didn't use capsicum in the frittata because gross. 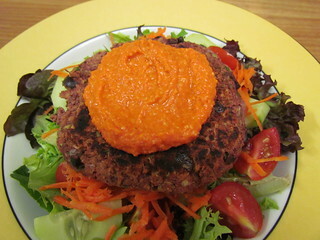 I subbed in some grated carrot, corn kernels and chopped sun-dried tomatoes instead. It was amazing! The base is a cashew and tofu blend, which is fairly soft but still sets up nicely as you can see. Very sliceable! 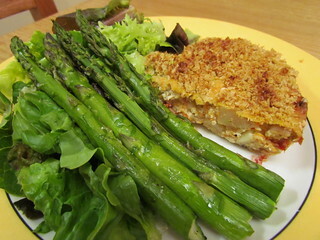 I paired it with Dreena's asparagus suggestion, which is very simple roasted asparagus with lemon, salt and pepper. 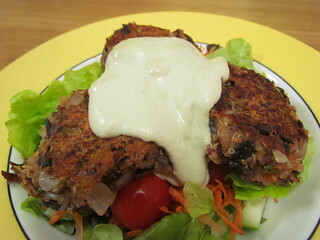 Mediterranean Bean Burgers with Romesc-Oat Sauce: Dreena does good burgers. These are based on kidney beans and oats, with lots of herbs and add-ins for extra flavour. Plus they hold together very well. I served this with an out-of-character for me romesc-oat sauce, which was included a roasted red capsicum. But there are plenty of other flavours in there, including almonds and oats, and the flavour mellows nicely if allowed to sit in the fridge for several hours, so it was actually not too bad! Much better than other capsicum-based sauces I have for some reason tried. I served it all over a big green salad. 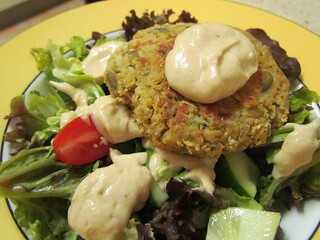 Citrus Tahini Dressing and Chickpea Pumpkin Seed Burgers: This was a tasty burger patty, with rice, oats, chickpeas and pepitas making up the base. The recioe calls for Annie's Goddess Dressing, which we don't have here, but there is an option included for if you don't have access to this (or can't have it because it contains gluten). 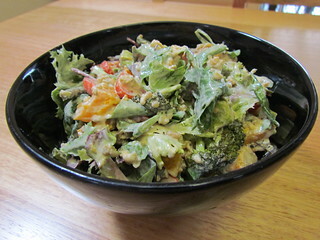 The citrus tahini dressing was quite sweet and thick, with orange and lemon juice providing the citrus flavour. The oil is optional, I left it out. Black Bean, Quinoa, and Sweet Potato Spicy Croquettes with Pumpkin Seed Chipotle Cream: The croquettes are cute and come together easily, and have a very pleasant flavour. The pumpkin seed cream was fun, using a mix of cashews and pepitas and some Tabasco hot sauce (I added just a tiny bit of that). 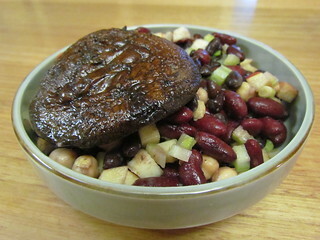 Juicy Grilled Portobellos and Three-Bean Salad: I like grilled mushrooms, even if they are considered 'boring' by some. This is a very easy marinade, and it certainly does cook up nice and juicy! 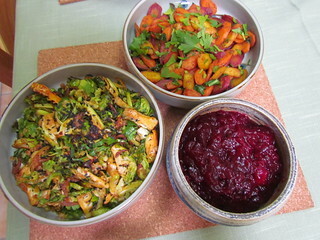 The salad was a nice addition to this dinner, and also keeps well for lunch - I got about three serves out of it. As well as beans there is celery and apple added in, and the apple gives it a yummy touch. 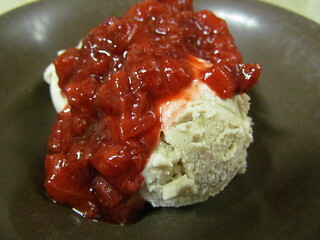 Macadamia Ice Cream with Warm Strawberry Sauce: This ice cream has a base of coconut milk and raw macadamia buts. It was very rich, but not too bad in the coconut fat stakes (I have a low tolerance). I used a mix of coconut and plain sugar in the recipe. 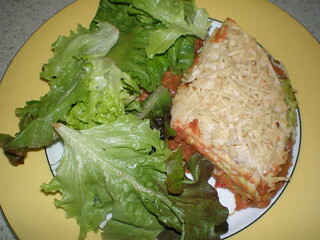 The sauce cooks down very well and thickens into a great topping. I used some slightly older strawberries and it was a great use for them. 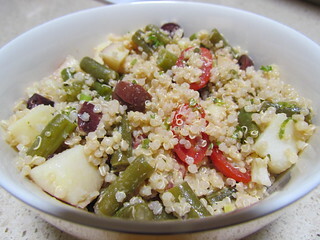 Quinoa Nicoise: I made up a batch of this for lunches one day, and got three good servings. It keeps very well. The dressing starts off very rangy, but mellows a bit with time. This was a very nice and refreshing salad. DJ's Hummus Salad Dressing: This recipe made enough for one big salad. It does call for agave nectar as an ingredient, but go easy on it because it can easily make it a bit too sweet. Tomorrow is the 25th of December here in Australia. Whatever the day is to you, I hope you have a good one! Pure Simplicity Health Bar opened up a while ago, replacing the Liquefy outlet that was at the same location. It has a focus on smoothies, juices and acai bowls, but also has a menu of breakfast and lunch items that are available all day. I've stopped by here a couple of times before to pick up a smoothie, but recently had a chance to catch up with some of my favourite people over brunch and decided to try eating here. Everything is vegetarian, with most things either vegan or able to be veganised. They have some gluten free options as well (though not so many of the savoury cooked options). Sorry some of the photos are a bit dark, for a place that has a big instagram presence they sure have some terrible lighting! The 'dish' of the day was definitely the peanut butter hot chocolate that is on the menu, made with soy. Funnily enough, the day before I had picked up a hot chocolate elsewhere with a hazelnut syrup shot, and was wondering why no one made peanut butter hot chocolate. And the next day, I was drinking it. This is delicious! I had two! 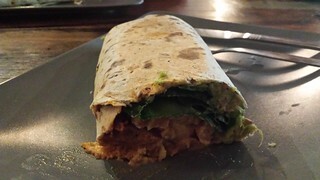 Lisa and I both chose the Breakfast Burrito with tofu ($12). This is stuffed with beans, tomato, mushrooms, spinach, aioli and tofu. I think the tofu is one of the Soyco flavoured tofus, it had the same texture and a slightly sweet taste. This was a tasty breakfast. 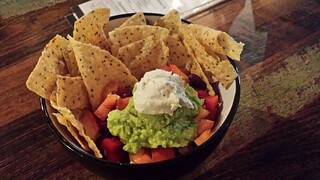 Marion had the Nearly Raw Nachos ($12, GF) with caspicum, corn, tomato, red onion, kidney beans, avocado, cashew cheese and corn chips. She said it was really fresh tasting and very filling. 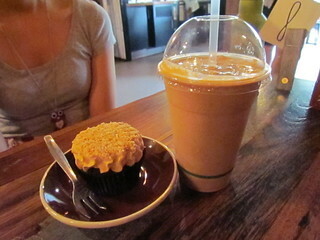 Jen had already eaten, so she just picked up a cupcake (to go with her PB hot chocolate). Pure Simplicity Health stocks Cloverly cupcakes, which are all vegan and always have a gluten free flavour. And Marion also had a Nut Buttercup Smoothie ($8 regular, $10 large), which had almond milk, peanut butter, cocoa, banana, almond butter, cinnamon, vanilla paste). I am would be keen to try more of their menu, especially their burgers, and more of that peanut butter hot chocolate. The food came out relatively quickly, and it is a nice space. The toilets are a bit of a trek out the back of the building, and are not always the cleanest of facilities. 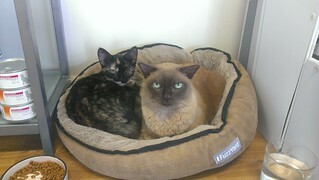 I've been having fun re-sharing some photos of old adoption and clinic cats. This little cutie is Daphne. She was surrendered to us with a broken leg and pelvis, which thankfully was able to be repaired. She used to hang out with me on call and sleep on my bed in the on call room. She got adopted by one of our former nurses. La Dolce Vegan by Sarah Kramer is a book that I bought when I was getting a 'three for the price of two' book deal, because it was the only other vegan book there. I haven't cooked out of it a great deal. If anyone has any recommendations, please tell me! I have blogged about what I have made a few times before. 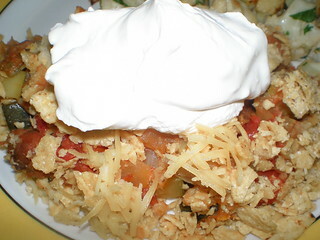 Pinto Bean Casserole with Tortilla Chip Crust: The 'crust' here is just a top layer, sort of like a tortilla chip pot pie. 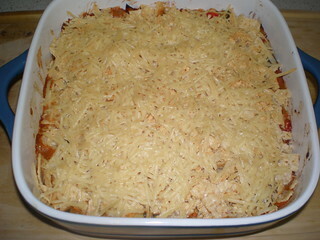 eans are mashed with seasoning, vegetables are added and the 'crust' is crumbled over the top, then covered in cheese. Definitely recommend the optional sour cream, it goes great with it. Karen's Mexican Burrito Pie: Layers of tortilla, mashed seasoned beans, avocado cream and cheese make fora very tasty pie, which you can see cuts into wedges beautifully. 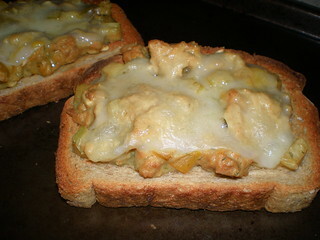 Tu-No Open-Faced Sandwich: This is tempeh based, and I made a double batch to use up my whole block of tempeh. Good news is that it very tasty, so a double batch will not go astray. 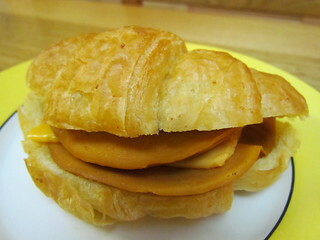 You can serve this on salad leaves, on bread or, as I did here, with cheese melted over it for a Tu-No Melt. Wolffie's Peanut Butter Cookies: I found this to be an incredibly oily batter once the peanut butter and canola oil required in the recipe was combined, and I had to cook them for a few minutes longer. However they baked up nice and crispy. 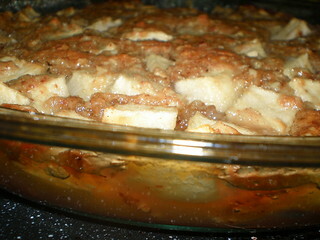 Apple Walnut Pudding: This was very quick to put together, and is a nice dessert for a cold night. This recipe actually appears twice in the book, once in the breakfast section and once in the dessert section, which is kind of strange. 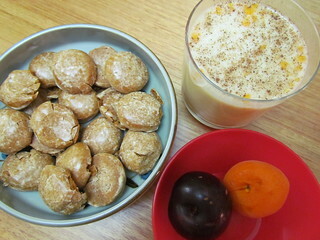 It is too sweet for me for breakfast, but if you like a sweet start to a cold day I can see how it would appeal. Roasted Pears in Maple Garam Masala Sauce: I don't make roasted fruit desserts very often, but I always feel a little classy when I do. 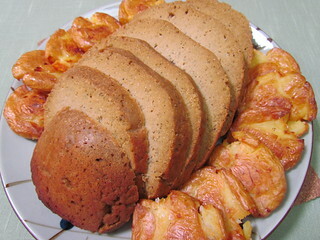 This is very simple and does not have many ingredients. The garam masala gives a nice flavour. 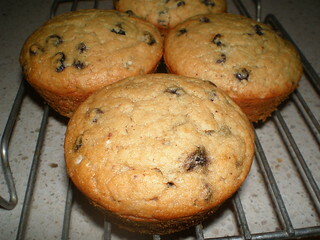 Banana Currant Rice Flour Muffins: These were a bit strange. The flavour was OK, but the texture was a bit off. They don't rise very much in the oven. 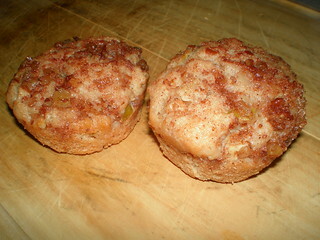 Cinnamon Apple Muffins: These were nice, especially with the sugar/nut/cinnamon topping. A finely diced granny smith apple gives the apple flavour. 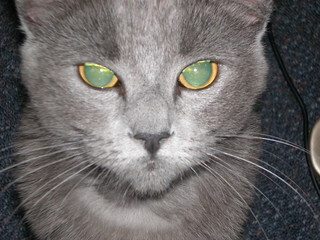 Another flashback to our beautiful clinic cat Abbey, who we had to say goodbye to earlier this year. 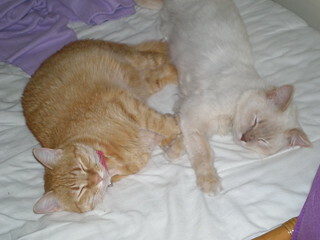 Abbey was such a good kitten carer, and here she is with a kitten named Valerie giving her snuggles. After my birthday dinner there a while ago, Mum and I decided to stop into Pu Kwong for a quick lunch after doing some shopping one day. 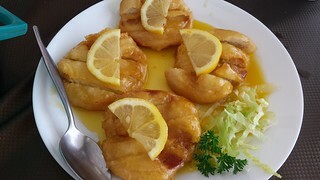 Mum was keen on trying the Lemon Chicken. The sauce on this was actually really nicely balanced, not too sour but also, more importantly, not too sweet either. Eating half of this dish did push me towards my tolerance for fried. I think it would be a fun dish to try if you were there with a few more people, or if you really like fried food! Because I knew that the lemon chicken was going to be a plate of fried, I decided some veggies were required and ordered Vegetables in Garlic Sauce. 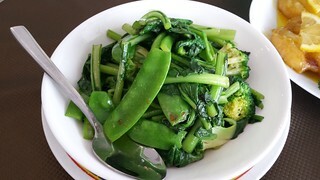 I was given the option between hard or soft vegetables, and I asked for soft... lots of green. I was very happy with this lovely plate of veggies that came out! The perfect side to the lemon chicken. We also had some rice and jasmine tea. It was a fun lunch! 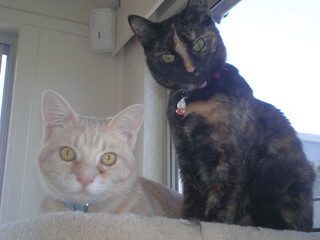 Two kitties, one photo! This doesn't happen that often.